Since 2012, Black Chip Poker has grown to be one of the better US-facing online poker sites. As part of the Winning Poker Network, Black Chip Poker offers players a wide variety of online cash games and tournaments with fantastic prizes and excellent promotions. 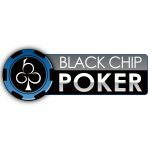 Black Chip Poker is licensed in Costa Rica and has earned a reputation from players for easy deposits in USD, fast and secure withdrawals and some of the best online poker action around. They also have a fantastic welcome bonus with a match up to $1,000. If you plan to deposit using cryptocurrency you can enjoy an insane 200% match bonus on your first deposit. Black Chip Poker offers a pair of fantastic welcome bonuses for new players. The first is their standard deposit bonus of 100% up to $1,000. Note that this bonus isn’t like casino bonuses where you have the money to play with upon deposit. Instead your bonus must be released and you do that by hitting the real-money tables. Your bonus will be released in $1 increments for every 27.5 Awards Points earned at the table. You get 5.5 Player Points for every $1 you pay in either cash game rake or tournament fees. That means you must pay out $5 in rake or tournament fees to get $1 released for your bonus. If you plan on depositing using cryptocurrency then you’ll be rewarded. The deposit bonus for cryptocurrency deposits is 200% up to $1,000. For example, deposit $250 and you can get $500 in bonus cash. The same release terms apply. Note that this bonus is only available on your first deposit. You cannot double dip by depositing with a credit card and then with cryptocurrency. Also, you must deposit at least $25 to take advantage of the deposit bonus. Finally, you have 60 days from the day of your deposit to clear your bonus. Any portion that remains uncleared after 60 days will be lost. You’ll have plenty of options for funding your Black Chip Poker account. For US players, your options are Visa, MasterCard, American Express, and direct money transfer using either Ria or MoneyGram. Other countries have additional deposit options that include Skrill, NETELLER, SOFORT, AstroPay, WebMoney, and PayPal. Players also have the option to deposit in a wide variety of cryptocurrencies. Bitcoin is easily the most popular form of cryptocurrency used for deposits but you also have a choice of over 40 additional altcoins you can use for deposit. You can deposit using Litecoin, Dash, Ripple, Ether, Bitcoin Cash, and even Dogecoin. The minimum deposit depends on your funding method. Cryptocurrencies have the lowest minimum deposit at $10. Credit card deposits require a minimum deposit of $25. Ria Money Transfer requires a minimum deposit of $50 while Moneygram requires a $60 minimum. The good news is that most deposit options do not come with a fee from the poker room. Visa is the only exception, and it is a notable one. For Visa deposits, you will pay a 10% fee on all deposits. If you max out your welcome bonus and deposit $1,000, Black Chip Poker will charge $100 in fees to use Visa. Any other associated fees with making a deposit will come directly from your funding source. This includes cryptocurrency miner fees charged to initiating transfers. Check with your provider to see if there are any fees with making a deposit. Unfortunately, Black Chip Poker is a bit behind on the times regarding mobile technology. They do not offer a mobile option for their website. Your only option is their downloadable client. They also do not provide a browser option for their website. 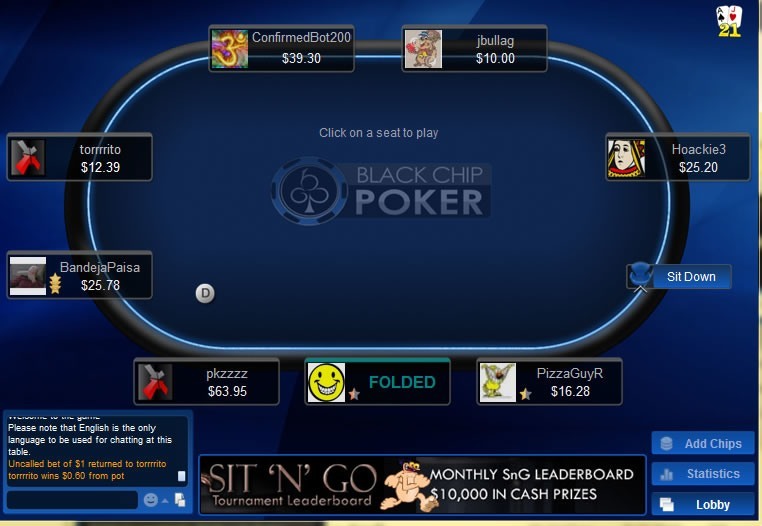 Black Chip Poker has an average spread of games compared to other online poker sites. Like many smaller poker rooms, they primarily offer Texas Hold’em games and that’s where the majority of action on the site takes place. They offer NL, Fixed Limit, and Pot-Limit Hold’em games, but often the only Hold’em action available is NL. No-Limit tables are available from micro stakes all the way to mid-stakes games. The smallest buy-in is $.01/$.02, and there are also CAP games where the maximum anyone can bet is $.60. The highest limits offered at $50/$100 NL. Most often, you’ll find steady action all the way up to $5/$10. Any higher than that and it gets tough to find games running. Outside of Texas Hold’em, Black Chip offers a nice spread of Omaha and Stud games. They offer PL and NL Omaha along with Fixed Limit, PL, and NL Omaha Hi-Lo. Stud players will find some action at this site but it will primarily stem from Stud Hi-Lo. They offer regular Fixed Limit Stud and Stud Hi-Lo along with PL Stud Hi-Lo. Most of the Stud action this site comes at Stud Hi-Lo ranging from $.04/$.08 to $5/$10. If you want to take a break from the poker tables, Black Chip also has a variety of casino games available including Blackjack, Slots, Bingo, and Video Poker. They also host a sportsbook with action on major sports leagues and events from around the world. Black Chip Poker offers a wide variety of tournaments with tournaments spread in every form of poker provided on the website. The majority of tournaments are No-Limit Hold’em and you can find a new tournament starting every fifteen minutes on average. Tournament buy-ins range from pennies and go all the way up to $1,000 on average. On occasion, special events such as their Online Super Series or The Venom will command larger buy-ins. This website boasts a wide variety of guarantees with some of their larger tournament boasting guarantees of $100,000 or more. Special events such as The Sunday Venom feature guarantees up to $5 million, promising huge prizes of up to $1 million to the winner. You’ll find most any variant of tournament you desire on this site ranging from Sit and Go satellites to bounty tournaments, time-based tournaments, knockout, and more. Many of the promotions featured at Black Chip Poker are in the form of special poker events. One of their most popular promotions is The Beat where cash games players earn points and help build a prize jackpot. At the end of the week, players are awarded cash prizes, tournament entries and more based on the number of points earned. Other promotions center around larger events such as their Online Super Series Cub3d and The Sunday Venom. These special events award massive prizes to the winners and players can take advantage of special satellites and freerolls to win entry into events. Head over to the promotions section to check out all of their current promotions and to keep up to date on new ones. As a player on Black Chip Poker, you’re eligible for Elite Benefits, which is their player rewards program. The Player Points that you earn at the tables can be later converted into bonus cash prizes. Starting at 100 points, you can exchange your points for wager-free cash. There are six player levels in the program that unlock as you earn points. When you earn 750 points or more in a month you move up in tiers. Each tier unlocks additional prizes. To learn more about player levels, login to your account and go to the awards section. Black Chip Poker has solid customer support consisting of an FAQ, live chat, phone, and email support. You can reach them toll-free at 1-877-314-4195. 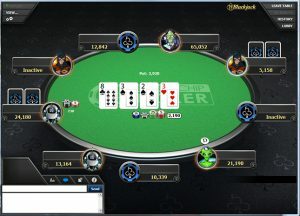 The fastest way to contact support is via Live Chat, which is available 24/7 and easily accessible from within the poker client. When we tried to reach customer service, we were connected to an agent almost immediately. Speakers were native English speaking and very helpful. When asking specific questions about services, make sure to remind them which site you’re playing as some sites on the Winning Poker Network to have different policies. US online poker players know that their options are limited so it is essential to pick a quality poker site. Black Chip Poker ticks all the boxes offering a lucrative welcome bonus, multiple options for funding your accounts, excellent customer service, and fantastic gaming with massive guarantees. Being part of the Winning Poker Network, you can expect a robust player pool as it is shared with sites such as America’s Cardroom. It is one of the largest US-facing online poker networks, meaning you will find plenty of action in tournaments and low to mid-stakes cash games. There are very few US-facing sites that have as stellar a reputation as Black Chip Poker and we believe that once you sign up and try them out you’ll become a loyal fan as well.